Smartphones are selling like hot cakes. Consumer and enterprise demand for apps are hitting the sky. But, the availability of right skilled mobile app developers does not match with the above-mentioned explosions. This poses a great problem to businesses since it makes them unable to launch their own app when their business competitors already have. Mobile app developer talent is the fourth among the most demanded digital talents. App developers are too busy to take up new projects. Dearth of iOS app developers is the worst. In most cases, it is the shortage of mobile app developers, not that of money and time, which keeps companies ‘app-less’. But all badly need an app to create revenue and engage customers. Developers are difficult to find as well as increasingly expensive. If one enterprise wants to build a cross-platform or hybrid mobile app which will work across the platforms, the problem gets more complex. Making native apps for each of the platform eats lot of time. Now most companies wants to build their apps with Web/HTML5, rest opting for native and hybrid app development according to specific needs. Regarding time, adevelopment team (six to fifteen developers) may take two-to-twelve months to complete an app, generally. And there are an estimated 2.9 million app developers in the world. Most of them work individually and their performance in app stores in the economic sense is bleak. 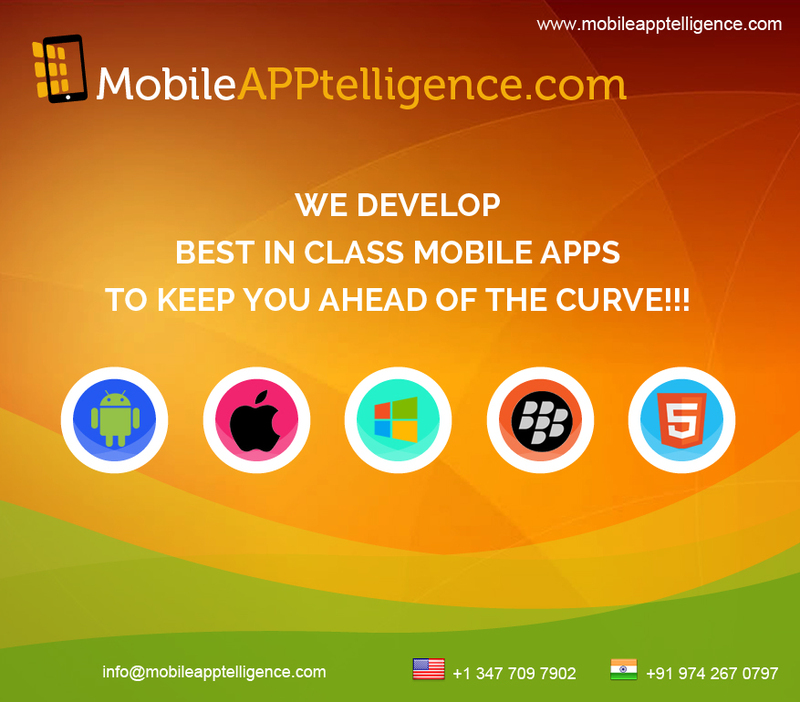 MobileAPPtelligence is an award winning web, cloud and mobile app Development Company. It does next generation mobile app development services for iOS, Android, Blackberry and Windows platforms. It has been named among the top 100 mobile apps development companies in 2013 by Silicon India. We have a team of professionals mobile app developers (android app developers, iOS app developers, iPhone app developers and iPad app developers) associated with the development of enterprise, ecommerce, educational, gaming and utility mobile apps. We provide Android App development services, iPhone app development services, iPad app development services, iOS app development services. Our Mobile app developers follow the below mentioned process during the mobile app development life cycle. A detailed project scope must be asked to assess overall design work. A complete project script is always helpful. The most important thing is to understand is the business goal. Each project has its own business goal: extra revenue channels, brand identify or simply a mobile version of one’s web product. This entry was posted in Mobile Apps Development and tagged Mobile App Developer, mobile app developer india, mobile apps developer, mobile apps developer in india, Mobile Developer, mobile web developer, mobile web developers. Bookmark the permalink.